The thread to share your latest reading experiences! I'm currently reading Bernard Porter's The Lion's Share, "a short history of British Imperialism 1850-1970." Porter describes British Imperialism (or "Colonialism" as he prefers) from the latter quarter of the nineteenth century onward as a symptom of Britain's relative decline in the world rather than a testament to its power--a theory to which I adhere also. Another appealing feature about this history of the British Empire is that it focuses strongly on the British experience of Empire, that is how its Empire influenced Britain itself and its servicemen (colonial administrators and military men alike). Although I haven't started reading it yet, I'll share my latest find. At Norwescon I attended an auction (A piece of art I had been bidding on in a silent auction went to the larger thing after four bids). There was also a charity auction going on at the time. 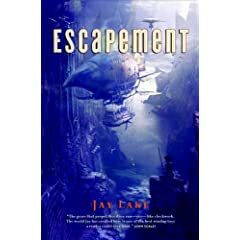 One of the auction ring leaders was Jay Lake, author of several works including a current piece called Escapement. I've never read any of Mister Lake's work, but he was a friendly, amusing and enjoyable guy, it was for charity, and the concept sounded interesting. I bid, and won the book. It hasn't been released yet; it's available in June. I'm rather excited (and Mister Lake Personalized it for me). Mister Lake himself described the setting as 'Clockpunk'... what else would you call a universe envisioned as an enormous clockwork, put in motion by God, complete with gears and a mainspring hidden at the Earth's center? I loved the cover art of Mainspring, and this latest installment in Mr Lake's oeuvre seems to depict the same airship from a different angle; an absolutely wonderful artwork indeed! Unfortunately, I never did read Mainspring, so I'll be curious to learn what you might think of Mr Lake's writing skills. 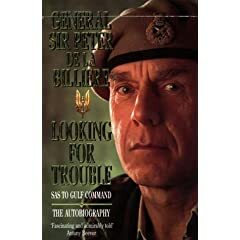 - I'm reading this at the moment; Looking for Trouble, by General Peter De La Billiere. It's his autobigraphy of coming from a quite delinquent youth suffering some tragic experiences, to becoming the commander of British Armed forces in the first Gulf War and OC 22nd SAS regiment. It's very inspiring. But they say "Violence is EVIL", and boys are best left to learn exiting new hairstyles, boo, hooo! Redemption trough life experience and fellow comradeship? What would that Soldier-hating, High Priest of the Wealthy Hypocrites, Bono, say? That book is about to burned by Hippies! I've discovered the most delightful series: Flashman by George MacDonald Fraser, an extremely funny series of a British Imperial antihero who cuts a swathe through the Victorian wars and uproars (and the boudoirs and harems) of the 19th century. Flashman — a self-described and unapologetic 'cad'—constantly betrays acquaintances, runs from danger or hides cowering in fear, yet he arrives at the end of each volume with medals, the praise of the mighty, and the love of one or more beautiful and enthusiastic women. I'm now reading Flashman and the Great Game which features the Indian Mutiny as a plot by Russia to weaken the British Raj -- the plot being led by the evil Count Ignatieff, whom participants in the old RPG over at nov-net should remember particularly! The book I read most recently was Concrete Reveries: Consciousness and the City by Mark Kingwell, who happens to be my philosophy professor. A very interesting look at how cities shape our identities and a celebration of concrete, beautifully written with a fantastic layout. He gave me a copy the day it was launched, right in lecture! This is because I had written him a rant email about how magnificent a philosopher A.J. Ayer was and how he should not be suggesting that the text Language, Truth & Logic was dry and lacking in style. Naturally, I also recommend that title. It's a nice cover. And the premise sounds quite interesting -- could you tell us a bit more about it?